The Venus Beings come forth as a collective consciousness to guide you in connecting on a deeper level with the love of your Higher Self. As you download the purest vibration of the love of your Higher Self you will also support humanity as a whole in realigning with their Higher Selves, opening to supreme love to create a major shift for all upon the Earth. This shift will impact and transform the Consciousness of Humanity allowing healing to take place. The Venus Beings wish to support you in receiving a new transmission of love from the Creator and experiencing a deepening love embodiment for the New Year. Capsule No 177 welcomes the Pleiadians as a collective consciousness to guide you in enhancing and empowering your Light Quotient. These sacred star beings share three individual meditations/activations to accelerate your spiritual ascension and strengthen the light of your inner truth. They support you in connecting with your Inner Child, healing the wounds of your Inner Child and allowing your Inner Child to reconnect with the Creator to support spiritual maturity and advancement. The Pleiadians guide you in rebirthing your mental body and mind of pure light, grounding this into your being to aid the luminosity, purity and clarity of your thoughts. Finally, they enable you to access and embody the power of your guides, downloading their sacred support into your being. Your inner power will be recharged and fortified while deepening your relationship with your community of guides. The Celestial Dolphin Consciousness offer to you an opportunity to reconnect with the pure vibrations and wisdom of Lemuria. They invite you to receive and reawaken with their assistance and transmission of light your Lemurian Key-Codes, Templates and Crystals. This is an opening to receive and synthesis with aspects of yourself and abilities you have separated from or require healing to fully manifest into your reality now. Renew, rejuvenate, restore your conscious awareness and access parts of yourself you felt were missing. The Celestial Dolphin Consciousness are guardians of sacred truth and wisdom, they wish to restore the sacred truth and wisdom of Lemuria within your being to empower your ascension. You are now ready to receive this valuable wisdom and energy transmission. They will also reconnect you with crystals you worked with in Lemuria, where you may have once hidden sacred knowledge from within your being. Whether you believe you existed in Lemuria or not you can benefit from the sacred transmission of the Celestial Dolphin Consciousness. Love and angelic blessings I extend through my being to you. 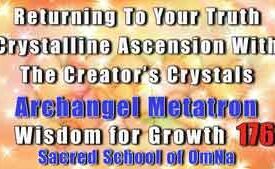 I am Archangel Metatron, the overseer of the Angelic Kingdom. I receive the angelic vibration from the Creator and distribute it through the Angelic Kingdom, so all angels may be of service aligned with the divine will of the Creator. My purpose in addressing and communicating with you today is to make you aware of the deliverance of the Diamond Consciousness into your being and into the Earth. The Diamond vibration and frequency extends from the Multi – Universal level of the Creator’s Universe, of which I am the overseer. The Diamond light also extends into the Cosmic Level acting as an expression of the synthesis of the Cosmic and Multi -Universal Levels. The purpose of the Diamond light is to share the clarity, clearness, directness and perfection of the Creator. It holds the qualities of luminosity, transparency, truthfulness and the organic flow of the Creator. The extension of the Diamond light into the Earth symbolises an upgrade in these sacred qualities within humanity, their actions and reactions and relationship with Mother Earth. Such transformations and shifts promote new understandings and comprehension about the way to live upon the Earth that is born from the essence of the Creator. While the Diamond Light will be anchored into the Earth and humanity, even more exciting is that the Diamond Consciousness will also be made available. The Diamond Consciousness holds the wisdom of the Multi- Universal and Cosmic Levels supporting the utmost clarity in perceiving and embodying the Creator. The wisdom is so clear, inspirational and pure that receiving the Diamond Consciousness creates beautiful shifts and awakenings within your being without even understanding the knowledge shared. The Diamond Consciousness brings forth a crystal-clear alignment with the Creator in all aspects of your being, promoting awareness free from illusions and an intense inner knowingness that brings forth peace and contentment. The Diamond Consciousness promotes an understanding of your existence upon the Earth and within the Universe of the Creator, thus allowing you to feel in oneness and harmony with all that is the Creator. Why is the Diamond Consciousness Anchoring into the Earth? The Diamond Consciousness is being directed akin to a beam of light into the Earth and humanity to cleanse illusion from the energy fields, chakras, emotions and minds of humanity as well as the entire physical and energetic body of Mother Earth. Illusions that have been long present and feel like fact or reality will be cleansed and erased. Clarity and truth will fill the space where illusion once resided. Transparency will fill the minds of many allowing them to see with new eyes the truth of the Creator within and around them. This will mean that you may find it difficult to hide your emotions and true thoughts as well as your expression of the Creator. You may feel like sacred energies are gushing from you and that you can see through the illusions that others are holding onto. You may discover that your spiritual awareness evolves allowing you to access new enlightenment bringing greater meaning to your reality and existence upon the Earth. The prominent purpose of the Diamond Consciousness is to bring forth the clarity and authentic nature of the Creator which is present within all being. While humanity will benefit from the grounding of the Diamond Consciousness, it is Mother Earth who will benefit the most as humanity’s relationship with Mother Earth is cleansed and purified. This will denote a new connection and understanding between Mother Earth and humanity rising. Manifestation of deep oneness, knowingness, compassion and working in unity will be created allowing both, especially Mother Earth to blossom and flourish. Most of humanity believe they have already seen the greatness of Mother Earth, and yet they haven’t even seen a small amount of the magic and wonder she holds and can create. Mother Earth is a magnificent being which humanity will recognise as they cleanse the illusions that surround them and their relationship with Mother Earth. She has the power to bring a deep-seated healing to her being and all in existence with her almost instantly, and yet she requires to be in oneness with all beings to achieve this. For this to take place humanity must recognise their oneness with Mother Earth. The Diamond Consciousness will be anchored into the Earth as a beam of light penetrating all beings and all aspects of the Creator. To receive the Diamond Consciousness personally and consciously, I, Archangel Metatron, wish to share with you a special technique that will allow you to embody the sacred qualities available to you now. ‘I open myself fully to receive the Diamond Light and Consciousness now.’ Repeat this statement as you press the fingertips of your right hand to the fingertips of your left hand with your thumbs meeting. Let your palms be facing but not touching, with your finger pointing up to the sky. You will experience a shift or opening within your being which may be experienced as a sense of peace, a surge of light or something else. When you feel ready keeping your hands in the same position raise them, so they are above your head with your arms straight. Imagine the Diamond Light and Consciousness flowing as a beam of light into your fingertips, fingers and palms. In the space between your palms imagine a small diamond shaped light beacon forming. This is the presence of the Diamond Light and Consciousness. Allow the diamond shaped beacon to emanate its light into your entire being. As if you are holding the most precious jewel or crystal, lower your hands and place the diamond beacon at your third eye chakra. Breathe its light into your third eye chakra. Lower your hands to in front of your heart chakra and breathe the light into your heart chakra. Lower your hands to your pelvis and breathe the light into your pelvis, root chakra and earth star chakra below your feet. Let the diamond shape of Diamond Light and Consciousness expand to encompass your entire being completely. Sit in the energy and breathe it into your entire being. Notice the healing, shifts and clarity that forms, maybe in unexpected ways and areas of your being. Allow illusions to be dissolved and a new sense of clarity to dawn. Expand the diamond shape to encapsulate Mother Earth and allow illusions between you and within your relationship to be dissolved and cleansed. Rest in the energy and receive for as long as feels comfortable, I, Archangel Metatron, will be present to support you. After you have experienced your alignment with the Diamond Light and Consciousness call forth the energy daily into your being using the following affirmation, ‘I open myself fully to receive, embody and express the Diamond Light and Consciousness now.’ Take a moment to acknowledge the light flowing through your being and activating from within you and then continue with your day. In the coming days, be aware of any new insights, greater clarity and the presence of illusions falling way, this will allow you to recognise the presence of the Diamond Light and Consciousness within your being and reality. Take time to nurture your connection of clarity and oneness with Mother Earth by simply sending time with her, either within nature or within your meditation. Notice how your interaction with Mother Earth shifts. Alignment with your being is to ensure you are connected with your soul and soul group, as well as your guides. This simply requires you to create a request each day or every few days for your entire being to be aligned with your soul, soul group and guides. Alternatively you can meditate to experience this fully. Alignment with the Creator to receive all the necessary Creator qualities and guidance will also benefit your ascension now. Alignment can be experienced as a request/ intention or during meditation, inviting the Creator to embrace you fully. Alignment and balance are especially important when you are feeling stuck, confusion or insecure. Blissful and peaceful blessings, we, the Celestial White Beings share with you now. We wish for you to recognise the bliss and peace within your being, as this is your power and your access to your truth. We embrace you in blissful and peaceful energy from our celestial levels, supporting you in each moment in exploring the presence of the Creator within you. The Creator can be born through your expression as numerous qualities, the Creator is everything and yet also nothing. There are so many of the Creator’s qualities to explore and reactivate within your being and yet all can be recognised as a complete feeling, sensation or knowingness within your being. Recognise that as an expression of the Creator you are everything and all that is the Creator as well as being expansive, unknown and incomprehensible. To begin to acknowledge yourself in meditation or quiet time with this understanding allows you to detach from your current identity and reality if only for a second to recognise yourself in a new way. This process also allows you to expand your focus beyond current thoughts and perceptions which seem so real to you, liberating yourself. Bliss and peace always exist within your being, you could say the energies are the makeup of your soul. When you allow yourself to be liberated from thoughts and perceptions connected to you and your reality you come to rest in the space of peace and bliss. The sacred presence of peace and bliss is able to expand to support and nurture you allowing you to approach your reality with a new vision or understanding. In doing so you are allowing the Creator to breathe through you and into your reality. In a sense you are giving energy and attention to the presence of bliss and peace within you which allow both energies to become alive and active. To accept the presence of bliss and peace within your being is not to erase or eliminate all negative or limiting thoughts and perceptions about yourself, others and your reality. Instead it is to recognise and choose where you place your energy, attention and devotion. If you are enjoying, energising and giving power to thoughts that limit and disempower you then you will experience a reality that limits and disempowers you. If you are directing your energy, focus and attention to the knowingness or belief that peace and bliss exist within you then you will experience a reality where peace and bliss emerge and manifest. Therefore, there is a need to choose the thoughts and perceptions about yourself, others, your reality and even the Creator that empower and support your existence of fulfilment upon the Earth. Become aware of your automatic patterns or limiting thought habits. Awareness reduces the power of the thought patterns and allows you to refrain from affirming the limiting thought pattern any further. Distraction further disempowers thought habits. When you place your focus elsewhere you withdraw your power from the thought habits. Each time you achieve this you are disempowering the thought habit until it becomes powerless. The habit is dissolved because you have stopped the energy flowing to the thought habit. Due to your mind no longer following the pathway of the thought habit it simply no longer exists and therefore no longer bothers you with its presence. The distraction can be anything of your choosing. We the Celestial White Beings encourage you to focus upon the presence of peace and bliss within your being, however you may focus upon anything that you wish to experience within your reality. Your focus doesn’t have to be the same each time and the focus doesn’t have to be for a lengthy time. It can simply be as quick and fleeting as the habit thought you were aware of entering your mind. In many ways thoughts are designed to flow through your mind. It is the action of changing the flow of your thought patterns that creates space for you to focus within, accessing the truth of your being and the presence of bliss and peace. What you focus upon, you become, and it turns up in your reality as experiences and life. Be aware of the space you are creating to acknowledge your inner truth. Allow yourself to become conscious of the presence of the Creator within you becoming clearer and available to you. This space may feel unusual or you may not even recognise it at first. Maybe you will perceive it as feeling relaxed or at ease. You will be able to recognise the presence of the Creator unfolding and occupying the space within you as you may feel peaceful and blissful. When you are able to sense this space within you, allow yourself to melt and seep into the energy and presence of it. In doing so you expand the space further, balancing and aligning your entire being on all levels. It may take practice to recognise the space of the Creator within you. It may be something you have been experiencing for a while and are only bringing it into your full awareness and realisation. The unfolding space of the Creator within you may feel liberating, loving, gentle, powerful, truthful and transformational. Becoming accustomed to the energy will allow you to recognise it with greater ease in meditation and everyday life. What does being the active presence of peace mean to me right now? What does being the active presence of bliss mean to me right now? These two questions invite you to be in the present moment with the energy of peace and bliss within you, recognising yourself as an embodiment of these sacred energies. You are also encouraged to recognise the impact of the energy of peace and bliss upon your being and within your reality in each present moment you contemplate these questions. Contemplating how these sacred energies are expressed and put into action through you. Take time to contemplate one question at a time during meditation or quiet time. As you become accustomed to experiencing the energy, its flow and inspiration within and through your being so you can begin to ask yourself one or both of the questions on a regular basis throughout your day. Especially when you feel stuck, unbalanced, upset or confused. The questions allow you to recognise that peace and bliss are already within your being, ready and available to support and guide you, there is simply a need to bring your attention and focus to the energy. Greetings, we are the consciousness of the Holy Family, the souls who supported and partook in the mission led by many such as Master Jesus, Mary Magdalene, Mother Mary, Grandmother Anna, Sar’h and so forth. We are thousands of beings sharing our consciousness now with you. We all played an integral role from the Earth and the inner planes in the major ascension shift which took place during that time upon the Earth. Many believe there were only key souls who instigated powerful shifts and upliftment of energy for all, the entire world in fact. There was a need for many souls to add their power, knowledge and to share the divine guidance given to them by the Creator. The souls whom you see as leading the ascension mission were the links that held us all together. Joining our power in oneness as they reminded us of our unity with all. We are the sick which were healed, those who were inspired and those from the inner planes. We, the consciousness of the Holy Family, remind you that ascension cannot be achieved by you or any other being alone. Ascension is a remembrance of the truth of the Creator and most importantly a recollection of the power of unity and oneness. We realise that many of you are trying to achieve your ascension alone, maybe hiding yourself away in meditation or feeling that your ascension is personal only to you. This is to encourage the ego in its belief in separation, especially separation with the Creator. When one soul raises their vibration, every other aspect of the Creator is influenced in a positive and loving way. This does not mean that there is a need for you to work alone and in doing so, you will support the spiritual evolution of all. Instead, you can further harness the power of oneness and unity which is gifted to you by realising that if you engage with many souls to support your ascension, a powerful source of energy is created which impacts all aspects of the Creator in beautiful, awe-inspiring ways. Connection with others at a physical level is helpful, connection with others at an energetic level is breathtakingly powerful. The vibration, frequency and consciousness of your entire being including your physical, emotional, mental and spiritual bodies as well as highest aspects of your being. The wholeness of your soul and soul group. The highest vibration of the Creator before the source of the Creator which is often labelled your Mighty I Am Presence. Your Community of Guides or Ascended Masters, Archangels, Angels, Goddess Being and so forth, that you favour and feel a strong bond with. Angels who are linked to the intention you have created, such as if you wish to experience peace you could call upon the Angels of Peace. There are groups of angels devoted to every quality of the Creator, for example, Angels of Fun, Joy, Laughter, Divine Flow, Meditation, Relationships and so forth. The highest consciousness and support of those upon the inner planes and the Earth who wish to manifest the same as you. Mother Earth is available to merge with your energy to support anything that will aid the spiritual evolution of all beings upon the Earth and the Earth herself. The highest consciousness of civilisations who have already achieved that which you are focusing upon. The Divine Plan energy and source of the highest and purest vibration which serves all. The animal, plant, mineral, crystalline kingdoms and so forth. We, the Holy Family Consciousness bring your awareness to the understanding that you are never alone and there are always energies, support and aspects of your Creator you can call upon to work with you. This would result in not only your ascension accelerating with ease, perfection and speed; you would also be creating a powerful service to all. During our existence upon the Earth, we were guided to constantly call upon numerous beings, energies and consciousness especially from energetic realms to enhance our focus. The more we achieved this, the more power we were able to access and gift to others to aid their awakening. Each miracle experienced and achieved by the members of the Holy Family you are familiar with, were made possible by the power we all engaged and drew into manifestation. Imagine one soul calling upon and merging with different aspects of the Creator, then imagine thousands of souls achieving the same and directing the energy into a singular focus. This is how ascension occurs. Often it seems that beings upon the inner planes instigate the ascension shifts. However, it is a co-creation or merge of power with one focus from those upon the Earth and the inner planes. You have a divine role to play, and you are the instigator of the merge of power. As a physical being, you are the anchor, the link that bonds the energy of the Creator. You are also the expression through which manifestation occurs. It is important to realise you are equal to all those upon the inner planes; you simply are achieving a different role upon the Earth, this does not mean that you are less of a spiritual being in any way. It does, however, mean that you have the mission of discovering how to work in harmony, oneness and truth with all aspects of the Creator upon the Earth and the inner planes to bring forth the power of the Creator. Decide upon your intention. What do you wish to achieve or experience? Decide or follow your inner guidance as for the energy or energies you wish to call upon to support you and to merge with you. In your own words call upon those you feel guided to connect with, to link with your energies and merge their light, love, support and consciousness for the highest good to assist you and all aspect of the Creator. Take a moment to breathe deeply and experience the energy of those you have called upon lending their energy and merging with your being. In truth, you embody all they share with you. You become a greater wholeness of the Creator, accessing the power of unity. Now achieve the intention you created in step one, whether it was a meditation, spiritual practice, activation, healing for self or others, in truth, anything. After completing the intention, thank those you called upon and the power they have gifted to you through their unity. Then focus on grounding yourself in a way that is most appropriate for you. Remember that you are never alone, and you never have to do anything alone, whether you are achieving something physical like a job interview or spiritual like connecting with your soul. It is time for lightworkers to access and experience the power we, the Holy Family Consciousness, accessed. It is time for you to realise that you have the power to accelerate the ascension of all through the simple things you do each day. A download of energy is preparing to flow through your being as requested by your soul and higher aspects. White pearlescent energy will channel through your being vibrating at a quick speed as it moves through you. As the white pearlescent light touches the energy of Mother Earth, it expands outwards from below your feet creating the most beautiful waves of colour as if a blanket of flowers has manifested. The multicoloured light moves at high-speed interweaving creating beautiful impressions of glorious light. This process is continuous, with the white pearlescent light strengthening in presence flowing through the core of your being and the multicoloured light constantly swelling and oscillating in beautiful patterns. This is a creative gift and download of light which has numerous meanings. The key aspects of the energy download are the gifts of awakening innocence, creativity and the awareness of beauty. These sacred qualities are the essence of the Creator, the foundations of your ascension and virtues of your being. Innocence is the truth, purity and simplicity of your energy, journey through the Universe of the Creator and life upon the Earth. When you connect with the vibration and presence of innocence within your being you are reconnecting with the source of all that is; the Creator. You are remembering yourself beyond words, limitations, ideas and even thought. You recognise yourself as the indescribable presence that you are and that is eternally present within you. This is the knowingness that all beings seek, a knowingness which exists within all. Creativity manifests as the divine flow, manifestation and experience of the Creator. Creativity allows you to access the rhythmic patterning of the Creator, joyfully dancing in time with the Creator to generate and ground further sacred qualities of the Creator to be experienced by you and all. Creativity is a natural part of your essence; you are constantly in the flow of creation, your purpose is to create in ways that fulfil and remind you of the presence of the Creator within and around you. When you accept your inner creativity, you allow the Creator to seed light into your imagination, abilities and expression. The results can be unique, inspirational and filled with passion that leads you to an experience of your oneness with all that is; your ecstatic nature. Many people seek and at the same time fear their ecstatic nature. Their deepest desire is to move through their ascension journey to remember their union with the Creator while also being deeply fearful of returning to the wholeness of the Creator. We, the Celestial White Beings, will share with you that your ecstatic nature is a remembrance of your presence and existence beyond attachment. Fear of remembering your ecstatic nature or in other words your union with the Creator is because of your magnification of attachments. So, we, the Celestial White Beings, ask you, why do fear embodying your ecstatic nature, what are you fearful of letting go of or loosing? This question is very personal to you, everyone’s answers will be diverse. Your ecstatic nature is the awakening of innocence, creativity and the awareness of beauty from within your being. It is your awareness of your presence or essence without limitations and attachments. You may call this aspect of yourself your liberated, loving or enlightened self. Whatever label you place upon your ecstatic nature you know that it is the aspect of yourself which emanates and knows itself to be bliss, love, peace, truth and sacred wisdom, in truth, everything that is the Creator. The third quality of the Creator downloaded into your being and assisting with your connection to your ecstatic nature is your awareness of beauty. Beauty is a manifestation of the Creator’s energy because beauty exists within the Creator. Many souls are unwilling to realise themselves as beautiful because this would seem to lack humbleness. We, say to you that recognising the beauty of the Creator within your being and around you are a true act of humbleness. The beauty of the Creator cannot be denied nor obscured. When you allow yourself to recognise the beauty of the Creator within all aspect of your being and all manifestation of the Creator you are reconnecting with your exquisite, magnificent, limitless, fulfilled and whole self. You are seeing, sensing and acknowledging beyond attachment, perceptions, judgment and lack, realising instead that you are deserving and worthy on every level of your being. This results in the realisation that the only person who judges you and therefore the beauty of your entire being is you. Those that judge you from the outside world are only a reflection of your personal self-judgments and disbelief in your inner, whole being beauty. We, know this can be challenging to accept. Our energy download, as described at the beginning of our communication supports the activation of your innocence, creativity and beauty. These energies we gift to you from our beings and from the Creator. The same energies we awaken within you now. Our purpose and mission is to guide you into a greater acknowledgement of your ecstatic nature, dissolving any fears of remembering your union with the Creator. We will achieve this by dissolving attachments, thus allowing your innocence, creativity and beauty to be expressed through your being, granting states and experiences of your ecstatic nature. When, we, the Celestial White Beings, speak of attachment, we are referring to your belief in something or someone being permanent, belonging to you or unchanging. The natural perception of your infinite self is that something or someone is free, constantly transforming and a gift for you to enjoy for as long as is appropriate, guided or needed. To exist as your truth is to be as love and to share love when love is present attachment of any form cannot be. Love dissolves the illusion of attachment. To dissolve the presence and creation of attachment, there is no need to disconnect from people, gift your belongings to others or disassociate from the material world. Instead simply be love and share love and you will notice the illusion of attachment dissolving and dispersing with ease. Allow yourself to sit peacefully as we, the Celestial White Beings, bring forth the download of our energy into and through your being. Imagine, sense or acknowledge our white pearlescent light flowing into your being. Allow yourself to breathe the light deep into all aspects of your being. Imagine our light touching Mother Earth creating such beautiful colours of light. Be present with the awakening occurring within you and any observations regarding attachments that may surface. Let us lead you into your ecstatic nature for you to explore and experience fully. We are present to be of service. Greetings, we are the Council of Sirius, we are a gathering of souls commissioned to deliver wisdom to those upon Sirius from the Creator to support ascension, while receiving wisdom from other areas and aspects of the Universe of the Creator. We are known as guardians of knowledge and communicators. We ensure harmony between Sirius and the entire Universe of the Creator. We come forth to share with you our knowledge and communicate with your soul to support the essential awakening of ascension within your being and the civilisation of the Earth. We hope you will accept the energy we share with you now and ask you to surrender the thoughts of your mind to reveal the wisdom of your soul. Sirius is famous due to the presence of the Great White Lodge of Ascended Masters and the Ascended Master University. Many wish to attend both the Lodge and University to aid their mastery and achieve their initiations to become realised as an Ascended Master. We, the Council of Sirius wish to use this opportunity of connection to share with you insights of how we and many upon the inner planes are supporting you, all upon the Earth and Mother Earth in your current ascension period and the year of 2018. Many of the Earth’s Cycles are coming to an end. Cycles of energy once activated within the energetic body of Mother Earth are weakening and dissolving. Some of these cycles and energy patterns were created at the origin of the Earth while others were created thousands and hundreds of years ago, even ten or five years ago. Many of these energy cycles are positive and supportive to the Earth while others are negative, limiting and harmful to the Earth and her inhabitants. In order to release and dissolve the limiting energy cycles which still imprint into the energy systems of those born upon the Earth, there is a need to surrender some positive energy cycles as well to bring balance and harmony. Such energy cycles have been influencing all aspects of humanity, especially thought processes and emotional states. A cleansing is required which is being supported by many upon the inner planes. As humanity seeks the Creator, awakens to their ability of creation and regains their inner true power, so humanity is breaking and shattering cycles of energy which have been deeply embedded within Mother Earth. This is creating a beautiful healing for all while allowing turmoil carried by you from previous generations hidden deep within your being to be recognised and dissolved. It is due to this healing of the Earth’s cycles that there is a need for you and all of humanity to focus upon that which you wish to experience in your reality and for all. Thought processes devoted to peace, harmony, the awakening of truth, love, compassion and forgiveness will create new energy cycles that mirror the truth of the Creator you wish to embody and recognise upon the Earth and within all. We, the Council of Sirius encourage you to create intentions born from and carried forth by the love of your soul focused on your highest vision for yourself and all. Praying, mantras, affirmations, intentions and positive thoughts will support the new creation of the energy cycles of the Earth, liberating many to see, sense and acknowledge the Creator more fully within your being. Everything you create impacts the Earth, ascension now and generations to come. The Mirror Ascension Initiation process is taking place for many upon the Earth now. It is a simple process where your awareness is heightened allowing you to realise that everything, everyone and many experiences outside of yourself are a reflection of the energy, emotions or thoughts within your being. The Mirror Ascension Initiation also works that you may attract people, experiences or energies into your reality that represent the qualities and abilities you already hold within your being and require to be activated. A deeper realisation of self and connection to others manifests as well as the ability to recognise that which is required within you whether healing or activation. This is something to be aware of at this stage of your ascension. 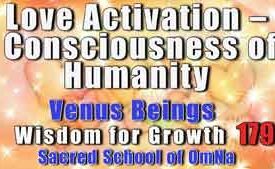 The process of rewiring Mother Earth and Humanity began many years ago especially assisted by the Venus Beings who began to align Mother Earth and humanity with their planet Venus and therefore a high-frequency vibration of love. 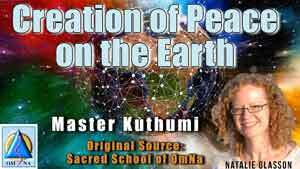 This process of aligning the Earth and humanity to dimensions within the Universe of the Creator continues now, allowing immense wisdom, light, love and enlightenment to cascade into the Earth and humanity. The immense volume of light is causing a rewiring of Mother Earth and humanity, meaning that core energies, codes, channels and chakras of the Earth and humanity are being upgraded to align with higher purer frequencies of the Creator. It is important at this time to ensure that you open your energy system daily to receive the light of the Creator, grounding and anchoring the light through your being and into Mother Earth. Not only is the truth of the Creator awakening within your being now, the truth of humanity and Mother Earth is awakening, bringing original pure energies and consciousness to the surface for all to remember. Truth is coming to the surface at personality and society levels as well. No longer can lies, deceit, fabrications and malice remain hidden or hidden in full view. Many are beginning to see through dishonesty, even within themselves and are seeking the truth and love of their intuition to guide them through the release and healing of false beliefs. It is because of this that focusing daily on listening to your intuition and following your inner source with action is immensely important so that you may move forth easily and effortlessly. Humanity is beginning to realise that they are the cause of all creations upon the Earth and within their realities. This is a great realisation even if it has not yet fully entered into the minds of many, the knowledge is present within their energy field and is dawning. Contemplating that which you cause and the effect your creations have upon yourself, and others now creates a powerful inner awakening, while allowing karmic energies to be healed and released. Due to the growing presence of love within every soul upon the Earth, even if they are unaware of it, energies of peace and humility are dawning. We, the Council of Sirius are especially lending our energy to support the further awakening of peace and humility within those upon the Earth. We are initiating many healing waves over the coming year to support this activation within your being. You may call upon the Council of Sirius to activate and awaken your inner peace and humility from the core of your soul, and we will support you until you can recognise these two aspects of your being clearly within your being. Those focused upon their spiritual evolution are being guided to recognise their inner facets or most sacred aspects of themselves within the source of their being. Many are being faced with during meditation aspects of their sacred source which are so divine, heavenly and blissful that it creates such profound healing and a sense of the immense power within. Ask during meditation to realise and recognise the most sacred aspect of your inner source. Each time you practice this, you may become aware of different aspects of the same energy within you, allowing you to access the wholeness and completeness of your being. Soul’s upon the Earth moving through the advanced stages of their ascension may for a few months experience what is known as a Frequency Pulsation Activation. This is akin to an electric shock created by energy. It is when a powerful energy surge flows through your being for a short time with the purpose of cleansing your being and awakening your entire being, aligning you to a new light empowered consciousness. This specifically works with the mind and the influence of the mind upon the entire being, ensuring that the mind influences your being in light empowering ways. There are so many more insights we could share with you. However, we feel we have shared the most important at this time. You may wish to be aware that we, the Council of Sirius are also supporting the repairing of Mother Earth’s auric field and her reconnection to the inner planes as well as the cleansing of the water within the body of Mother Earth and all upon the Earth.